Tradition has it that St Moluag came from Ireland in AD562 to found a monastery on Lismore a year before his more famous contemporary, St Columba, founded his on Iona. Until now, the only concrete evidence has been a broken 8th century cross but, now, a community dig near the parish church (the surviving chancel of the medieval cathedral) has revealed part of an enclosed, early medieval cemetery. Radiocarbon dating places one of the burials in the 7th century AD, and another in the late 10th century AD. Well-preserved bones of this age are very rare in Scotland, and their survival can be attributed to the lime-rich soils of the island. Another tradition is that the Cathedral of Argyll was established on Lismore in the 13th century, within the boundaries of St Moluag’s monastery, because of the established sanctity of the site. The findings in 2018 now confirm this continuity of Christian worship. There are strong parallels with Iona, where the later abbey was built within the ditch and bank (vallum) defining the extent of St Columba’s monastic establishment. Robert Hay of Lismore Historical Society added, ‘I believe that we have found the cemetery of the early Christian monastery. This is extremely exciting not only because well-preserved burials of this date are rare in Scotland but also because it helps to explain why Lismore was chosen for the site of the first Bishopric of Argyll. The team of community volunteers can’t wait to get back to digging on the site’. The dig also showed that, in the 13th century, around the time the cathedral was being built, this part of the cemetery was no longer used for burial. Instead the team of volunteers found a metalworking site and a slightly later cooking hearth, dug down into the burials, on which oats and barley had been accidental burnt. Livestock and deer bones from the same period, showing signs of butchery, were found nearby. Clare said ‘we can imagine craftsmen involved in the construction of the cathedral, making tools and nails, later resting and enjoying a well-earned meaty meal. The fact that the burial immediately next to the hearth had had its thigh bone disturbed and replaced upside-down suggests that the cook had come across more than he/she bargained for when digging the hearth pit!’. 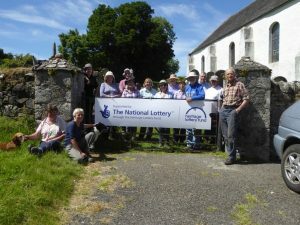 The archaeological excavation was led by Clare Ellis of Argyll Archaeology on behalf of the Kirk Session and Lismore Historical Society, and the project was funded by the Heritage Lottery Fund. Subject to securing financial support, the community archaeology of the site will resume in 2020. The small limestone Isle of Lismore (10miles x 1 mile) lies in Inner Loch Linnhe between Oban and Appin. It was the seat of the Diocese of Argyll from around 1200 to the Reformation (1560). The present parish church was formed from the chancel of the cathedral (built around 1250). The ruined nave and tower have been the subject of community digs in 2016 and 7. A long-term joint project between the Lismore Historical Society and Lismore Parish Church, with the professional support of Argyll Archaeology, aims to investigate, preserve and interpret the area round the church (which includes Bronze Age cairns, a nearby Iron Age broch, an Early Church monastery and the medieval cathedral). Lismore Historical Society/Comann Eachdraidh Lios Mòr was founded in 1995. It runs the Heritage Centre on the island, including a nationally-accredited museum, archive, library, shop and café. It has organized community archaeology on the island since 2016. The Centre opens for the season on 1 April.